Fitnex T60 Commercial Treadmill w/ Heart Rate Control. Fitnex T60 commercial treadmill features Heart Rate Control and 26 built in programs including 6 custom learn programs. All information on the Fitnex T60 is displayed on a Profile Matrix LED Console. Fitnex T60 commercial treadmill employs premium grade components such as: Powerful 2.8 HP Motor, 60" x 20" running belt for room to roam and 2.5" precision machined industrial bearing balanced rollers to reduce vibration. The ultimate in looks, durability, comfort, ease of use. 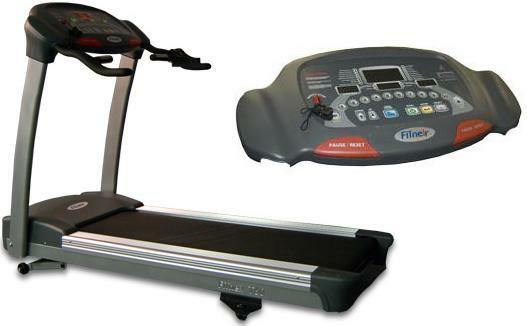 Fitnex T60 is a bet buy Commercial Treadmill. We back every Fitnex product that we sell with our 100% money back guarantee. If you have any questions please call us at (701)223-9936 or Toll Free (800)355-2956. For over twenty years, Fitnex has been manufacturing fitness equipment for some of the biggest names in the business. Now, we offer customers a direct product line that offers the best of both worlds – the highest quality equipment, tested and engineered by one of the largest and most experienced fitness related equipment manufacturers in the world, coupled with a pricing plan that represents true value. Our penchant for design shows in every product we make. Fitnex equipment is not only engineered and tested to be the best, it is also easy to use – and stylish. - Pause/reset buttons: When pressed the run belt slows to a stop and the users time and distance is held for up to 3 minutes and then reset. Great quality, durable and user friendly. Love it!